We just got back from a road trip to southern Pennsylvania, by way of the Shenandoah Valley. The good thing about that route north is that one is never more than a few highway exits from a historic site or natural sight. 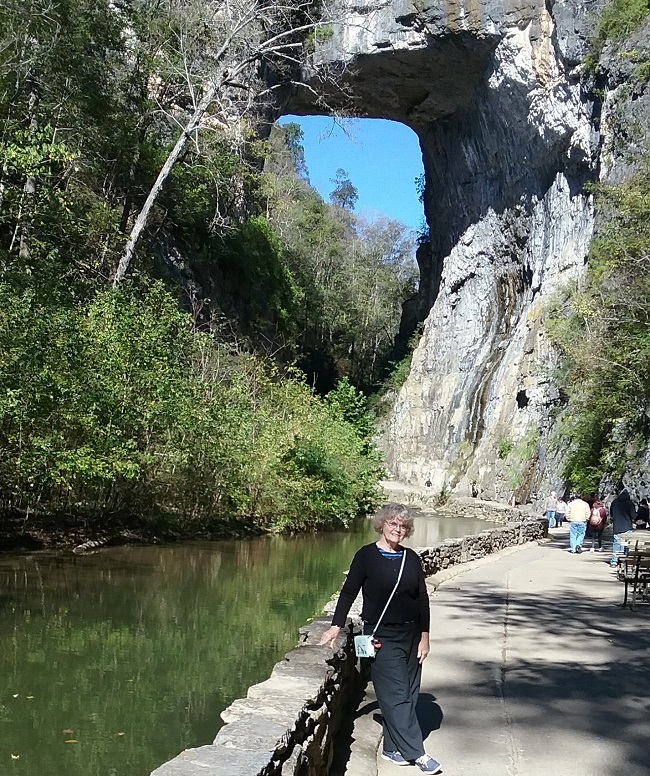 One of our stops was at the Natural Bridge, which is actually both historic and natural. 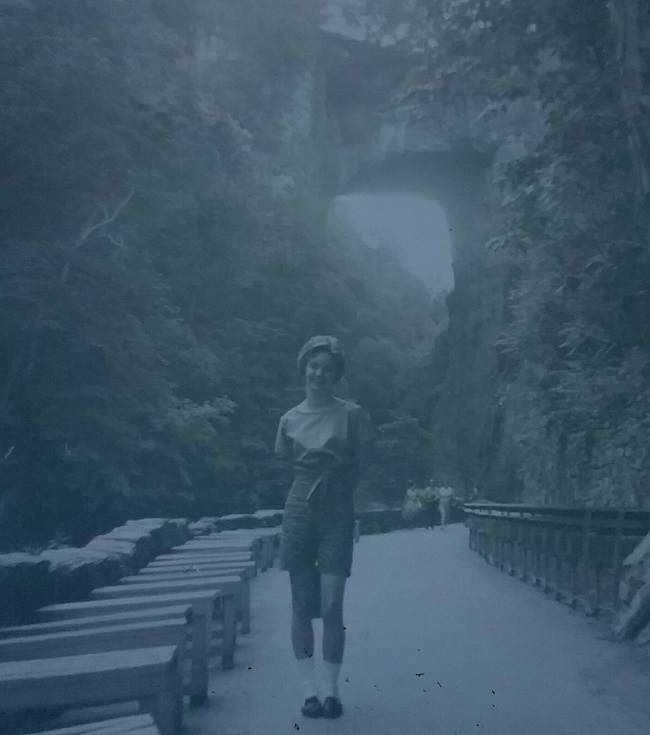 I’d been wanting to see the Natural Bridge ever since my cousin Nancy (above) visited it on a trip with our Aunt Adore and Uncle Corky in 1962. Being gone for a while is absolutely the best thing one can do to revive interest in the world. So much to see! I put the news on hold (a big relief) and just soaked in the experiences. But the news was here waiting for me, and I do have a bit to share. A lot has been said about how the antiques and collectibles market is rapidly aging, but there are younger people who are changing the way old stuff is acquired. A prize artifact was recovered from the ashes after the fire at the National Museum in Brazil. Heidi Klum and Tim Gunn have left Project Runway for a new program on Amazon. And Tim will have a fashion mini-series, American Style, on CNN. It starts in January. When giving back is the right thing to do: Colombian edition Nazi loot edition. Jonathan schools us on the history of women’s pockets. Remember how mercilessly ridiculed Princess Eugenie was for that poorly chosen hat she wore at the wedding of William and Catherine? Well, she’s had the last laugh by wearing the most stunning wedding ensemble I’ve seen in a very long time. Melania Trump went to Africa and she wore a “safari” ensemble, complete with pith helmet. Many were outraged, naturally, but I just thought it was funny. It’s a kind of 1940s cinema look, sort of like what Abbott and Costello wore in Africa Screams. What I found interesting was her reaction to the criticism. “I wish people would focus on what I do, not what I wear,” was her response. She should know by now that wearing clothes IS part of what human beings do. “Trash Fashion” is a thing, and it’s stupid. Art teacher plans to wear the same dress to school for 100 days. Outdoor clothing company Patagonia is giving all 1500 of its US employees a paid vacation day on November 6 so they can vote. The Sears catalog was a space of equality in the Jim Crow era (even though no black models were used). Thanks to Cornelia for the link. Welcome back! Love this update! All of it! I’ve got Vera guest segment ready to roll. Just waiting on a photo! Yea! I can’t wait to learn more about the other Vera. You were in my home land / Mason Dixon line below and just above. I hope you lived the scenery – it is beautiful. there used to be wonderful antique / flea marketing there? Yes! We crossed the Mason-Dixon several times as we drove from Philly to West Virginia. I could live there! Re: the teacher wearing the same dress for 100 days — maybe we should think of our wardrobes as “vacation packing.” I’ve lived out of a suitcase for as long as four months — and was a very happy traveler. Rule one: coordinate. Everything you’re going to schlep around in that suitcase has to work with almost everything else in the suitcase. Rule two: plain clothes, interesting accessories — and I prefer scarves to necklaces, because they have more impact and they weigh almost nothing. Rule three: washability. People used to coordinate their wardrobe for a season — or six months at a time. We could do that again! How great to see The Natural Bridge! I was there in 1949, a small girl two years old, sailing with my father and mother on my father’s Norwegian oil tanker for nearly three years. In spring of 1949 the ship docked for three months at Newport News and we had time to drive around. I am a new subscriber and look forward to your posts!